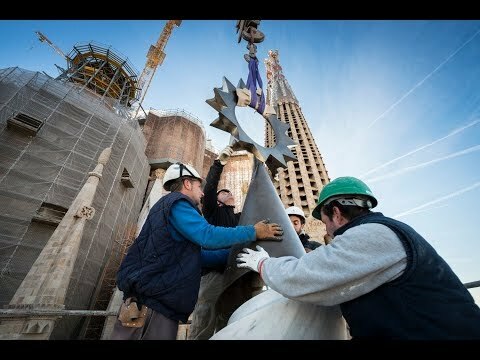 Work on the Sagrada Família began on this day 136 years ago. 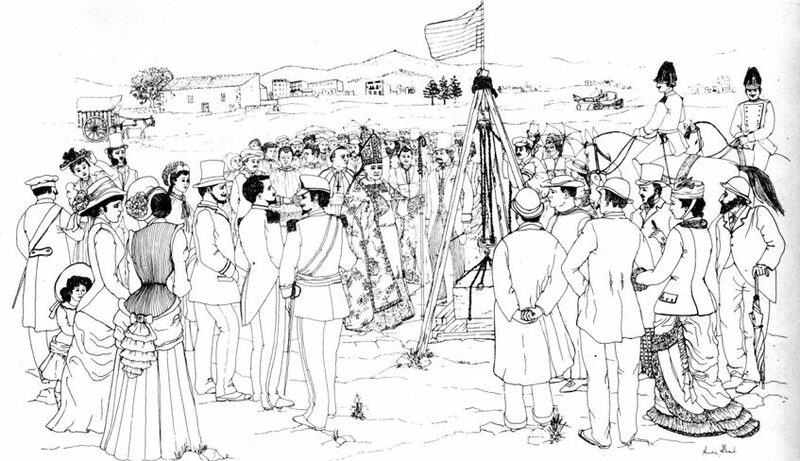 It was 19 March 1882, on the feast of Saint Joseph, when the cornerstone of the Temple was laid in an event with all the required honours featuring top civil, political, religious and military leaders, as can be seen in this engraving from that time. But why was this day chosen to break ground? It wasn’t random: it was symbolic. The promoter of the Temple, bookseller and philanthropist Josep Maria Bocabella, was president of the Associació Espiritual de Devots de Sant Josep (Spiritual Association of the Devotees of Saint Joseph). Bocabella wanted to build a great temple to calm the nerves of a society subjected to constant changes and agitated by social and technological revolutions of all sorts in the late 19th century. This intention, which to this day justifies construction of the Basilica, can be seen clearly in the founding act of the Temple, which says that the aim was for this work to “awaken sleeping hearts from their tepor. Exalt the faith. Warm charity. Encourage the Lord to take pity on the country (…).” This aim, desired and worked on for some years prior, materialised on a specific date: 19 March, the feast day of Saint Joseph. Three years after the cornerstone was laid, and when the works had come under Gaudí’s leadership, the central chapel of the crypt was inaugurated. This event, in fact, was one of three inaugurations at the Temple over the course of its history, each celebrating the completion of one section. The other two were the inauguration of the finished crypt and the consecration of the Temple as a Basilica, by Pope Benedict XVI in 2010, when the interior was fully enclosed. The most common, in fact, has been to carry on with construction without much time for celebration. However the completion of the central chapel, dedicated to Saint Joseph and the first part of the Temple to be finished, couldn’t go without an official celebration. And it also took place on 19 March, in 1885. 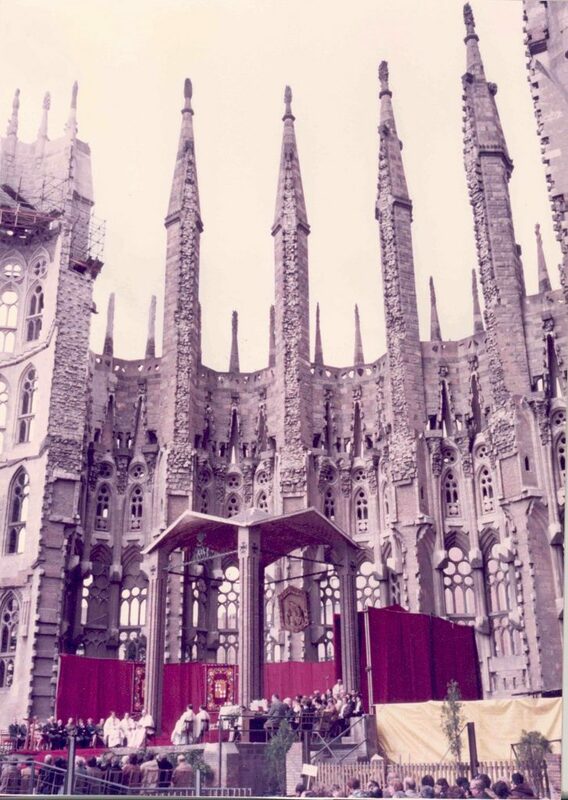 The Sagrada Família archive has an invitation to the event, illustrated with motifs Gaudí had designed for the chapel. The devotion to Saint Joseph is also illustrated in the symbolism of Temple’s seven chapels, dedicated to the seven sorrows and joys of Saint Joseph, which include the Annunciation, which was simultaneously a joy and sorrow for Saint Joseph in knowing he would have a son but that he was not the father; the flight into Egypt caused by the cruel threat of Herod to kill the innocent, with the joy of being safe there; and the loss of Jesus in Jerusalem to find him later speaking with the masters of the law. The connection between the works of the Sagrada Família and the feast of Saint Joseph can be clearly seen in documents collected on the progress of work. To assess the progress, in fact, this date was taken as the benchmark. 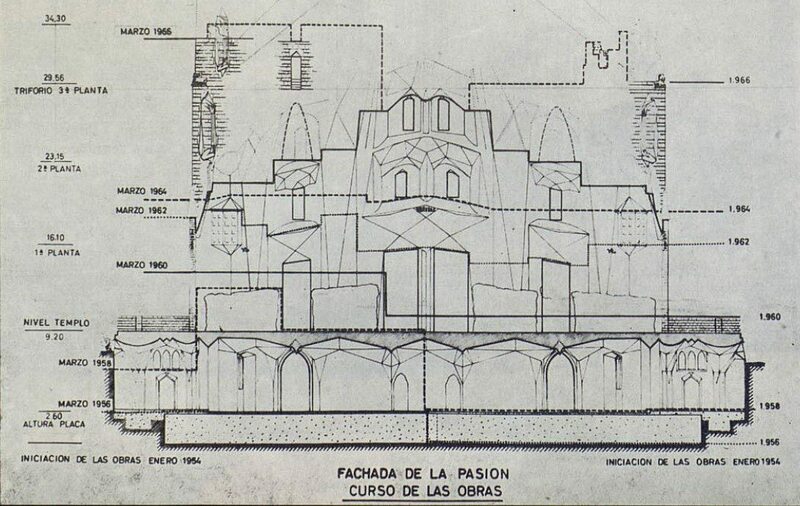 This can be seen on these plans from 1966, which show the progress of the works on the Passion façade in two-year increments, but always from March to March. 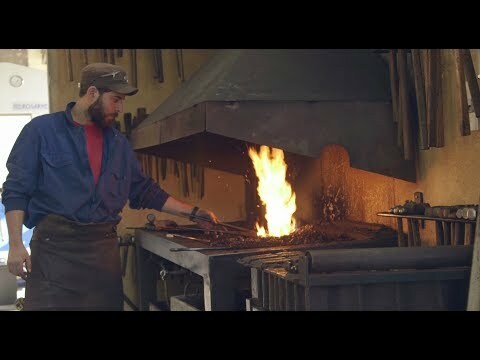 The ties of the Basilica of the Sagrada Família to Saint Joseph, however, aren’t only reflected in the role he plays inside nor the fact that the 19th of March was the day chosen to inaugurate parts of the Temple or assess the progress of the works. It seems that members of the promoting association always used to meet on this day and, furthermore, several special events or holy masses have been held at the Basilica on 19 March over the years. Looking at celebrations held on this date, we are reminded of the commemoration of the 75th anniversary of the laying of the cornerstone, on 19 March 1957. There are several photos of the holy mass celebrated on that day, with political and military leaders of the time, as well as a choir performance. The following year, 1958, the feast of Saint Joseph was chosen as the date to put the crèche sculptures on the Nativity façade, a donation from Banco de Bilbao with funds contributed by employees. Nevertheless, the most important celebration was the hundredth anniversary of the laying of the cornerstone, in 1982. 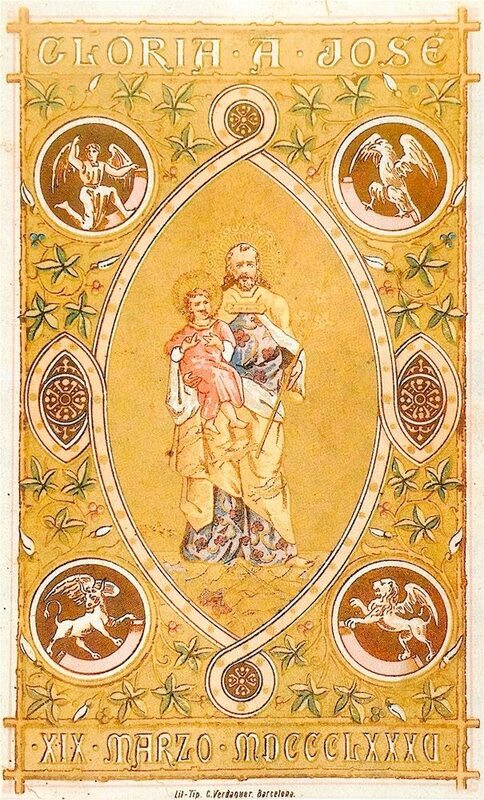 This anniversary extended beyond just the feast of Saint Joseph, with a long list of events that began on 11 March in the Saló de Sant Jordi at the Palau de la Generalitat. Plus, a board of honorary trustees was created for the occasion, with top leaders of the time, including the president of the Government of Catalonia (Jordi Pujol), the delegate of the Spanish government in Catalonia and the mayor of the city (Narcís Serra). Also on the board were many world-renowned architects and an ecclesiastical council featuring the Bishop of Barcelona and the Abbots of Montserrat and Poblet. 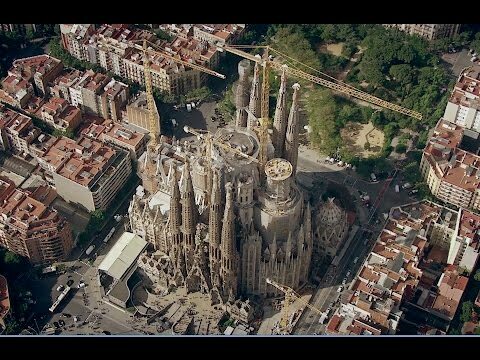 They took advantage of the presence of architects like George R. Collins (New York); Tokutoshi Torii (Japan); Jan Molema (Delft); Roberto Pane (Naples) and Joan Bassegoda, of the Gaudí Chair, as well as head architects Isidre Puig Boada and Lluís Bonet Garí, to hold a symposium of conferences to raise awareness of the project. There were also drawing workshops and guided tours of the schools. On the feast of Saint Joseph, a holy mass was held, as well as a choir performance and a parade of Barcelona’s giants. The hundredth anniversary of the laying of the cornerstone of the Temple was also commemorated by laying another stone, in this case a commemorative monolith, on the gate of the Passion façade, with a wrought-iron gas lamp that can still be seen today from the street. 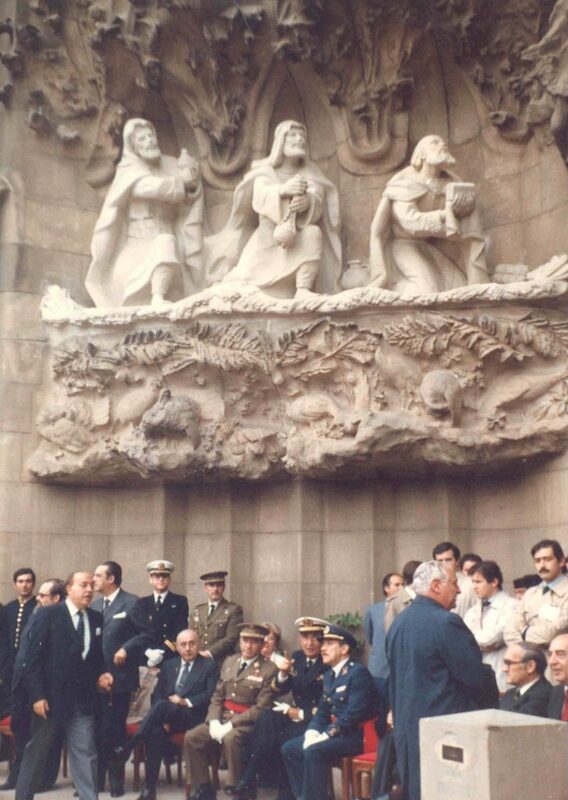 The scene of the Three Wise Men on the Nativity façade was also unveiled; a special fund-raising campaign was launched; an official postmark commemorating the date was issued at Barcelona’s central post office; and commemorative medals were made with the faces of Gaudí and Bocabella. On the 125th anniversary of the laying of the cornerstone, in 2007, there were also a series of events held, including an exhibition and a holy mass. More recently, on the feast of Saint Joseph in 2015, the Chapel of Saint Joseph in the crypt was re-inaugurated after being carefully, meticulously restored. So, the feast of Saint Joseph is a date that is closely tied to the Temple, which reminds us not only of the work that has been done since the cornerstone was laid 136 years ago, but also, in the end, the reason why work continues to make Gaudí’s dream a reality. The sculptures inside the Temple: The Holy Family… and Saint George! Head: Fundació Junta Constructora del Temple Expiatori de la Sagrada Família. More information. Purpose: To manage participation in the blog and share information regarding the Foundation's activities with the email provided. More information. Legitimacy of handling: Consent from interested party. More information. Recipients of data collected: Shall not be transferred to third parties except when required by law. More information. Rights you may exercise: access, correct or suppress details, as well as other rights, as explained in the additional information. More information. Official architecture blog of the Sagrada Família. 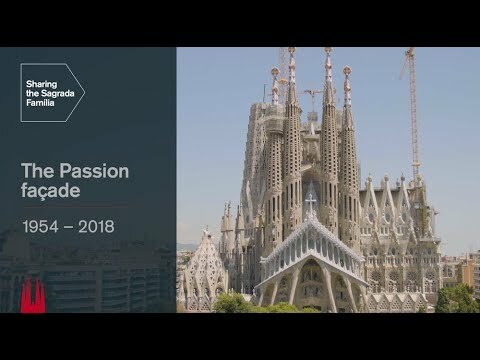 Here you can follow the progress on Gaudí’s masterpiece, which is expected to be completed in 2026, and learn about all the details.